You may remember when I wrote about the pop-up yoga events, Practice With Love, at the Southeast Neighborhood Library, which also happen at the United States National Arboretum and the United States Botanic Garden Saturdays and Sundays. The yoga instructors work for free but accept tips at all these events. You may also remember the Silent Disco at the Dupont Circle Fountain from back in June. You may have even stopped in your tracks when a whole lot of people started meditating around you while at the fountain, dropping an enlightenment bomb in the area. You may even have seen a whole bunch of adults engaging in something that looked a lot like elementary school recess. I was so intrigued by these defiant acts of happiness, I reached out to Heather Markowitz, the creative force behind With Love DC, which organizes many of these events as well as supporting others of a similar bent. The organization and publicity is carried out via Facebook only, with no advertising budget. By the magic of the internets, the events seem to reach those who need and want something silly and perhaps even magical to happen in their lives. “I actually deleted my Facebook, and only started using it again for these kinds of events,” admits Markowitz. Originally from New England, Heather found her calling early as an event organizer, especially through youth organizations such as the JCC; her parents’ warmth and support nurtured her energetic drive. 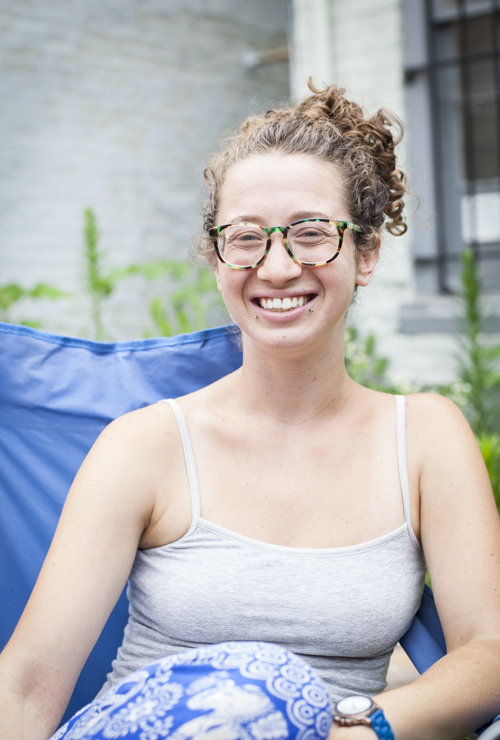 When Heather moved to the DC area a few years ago–first to Alexandria and then to the H Street NE area–she became involved with Made With Love Kitchen, a collaborative dining experience for people of all abilities, inspired by a good friend who worked at L’Arche. L’Arche is a non-profit that blends communal living with Christian values and encourages people with intellectual disabilities to find their spirituality. Since that initial project, more communal/spiritual experiences followed, such as the Peace Love Yoga Fest which took place this past May 16 at Blind Whino in Southwest DC. The silent disco was an organic blend of ideas: the concept is not new–you can even purchase expensive systems for your next party (! )–but doing it at Dupont Circle and with a soundtrack uploaded to Dropbox was a fun brainstorm with friends and her DJ boyfriend. The June 6 event went viral–over 13,000 RSVPs–and it was so much fun that With Love DC will do it again Saturday August 29. “Next time, I need a microphone,” she laughs. Apparently, during the first event no one was sure whether to hit “play” right at 8 p.m. This seems to have been the one minor snag in what was otherwise a very fun event. Although there was no official headcount, veteran Dupont Circle snowball fight organizers estimated around 3,000 people showed up for the event (the discrepancy between RSVPs and actual shows should make you feel better about your next party’s attendance). If you want a little more joy in your life on a one-on-one way, Heather also facilitates a workshop based on Julia Cameron’s book “The Artist’s Way” at Be Here Now Yoga on the Hill. Click the link to find out more; a new cycle starts in the fall. In the meantime, how about some yoga? Or some sitting?